This event was a HUGE SUCCESS thanks to great storytelling, spring weather, and the enthusiastic participation of nearly 200 (unofficial guesstimate) Durham lovers! Check out some photos from our walk on the Facebook event page and be sure to follow John Schelp's incredible Instagram account, @postcardsfromdurham! What: A Hike Through West Durham History with John Schelp! On Saturday, March 30, John Schelp, street historian (and longtime Open Durham contributor! 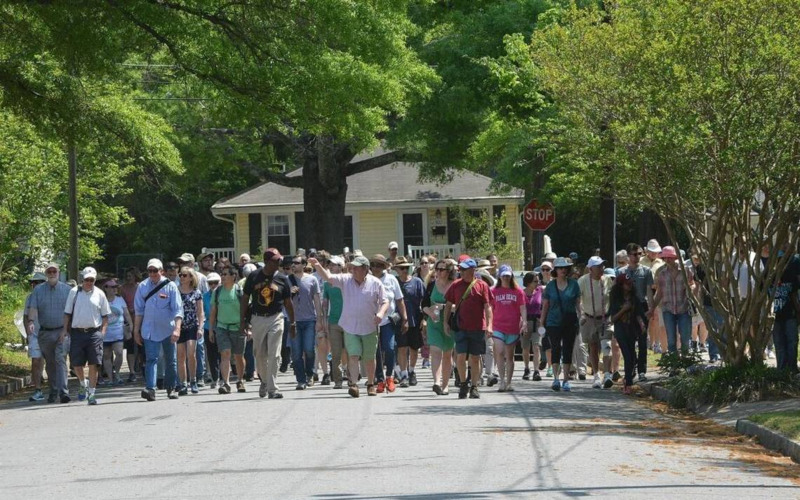 ), will lead his annual history hike through West Durham neighborhoods, Duke’s east campus, and beyond. If you are new to the area or just love the history and lore of Durham, this is an opportunity not to be missed. Witty, sincere, and fun, John has led this hike for more than a decade. The tour winds along neighborhood streets, back alleys, and across campus. Along the way, John will reveal what celebrity was born on a kitchen table in a house behind Monuts and who wrote the country hit “The Gambler.” He will explain why Walltown is called Walltown and why Duke Chapel was not built in Walltown Park. He will show you where Elvis slept, Madonna danced, and Kevin Costner appeared in boxer shorts. He will tell you what West Durham people were once willing to do just to get a little whiskey - and so much more! The tour begins at 10 a.m. and takes about two-and-a-half hours. Tour goers are asked to assemble at the corner of Green and Ninth Street about ten minutes early. There is no registration, no fee. Just show up. Wear comfortable shoes! The picture above should hint at the enormous turnout John has had in years past - bring the friends and family! If you want to brush up before you go, check out the links above and our neighborhood page for Old West Durham. We've got hundreds of pages in the area, but that's just the tip of the iceberg and they always need updates. Share pictures and insights you collect Saturday with other Durhamites in our online archive!